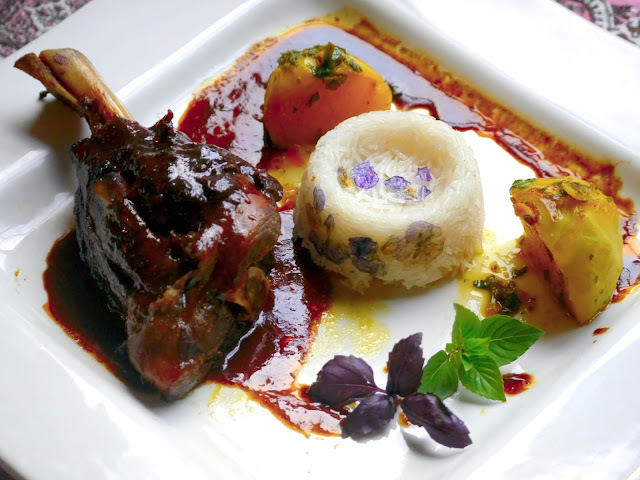 The presented deconstructed stew is inspired by two of author's favorite Persian dishes from the city of Shiraz: "Kalam-polow Shirazi" and "Yakhni (i.e. a lamb and kohlrabi stew, popular among our Shirazi side of family)." The stew is comprised of two parts, each inspired by one of the aforementioned dishes. The braised lamb part, inspired by the kohlrabi stew, contains Shiraz to celebrate the dish's deep connection to that city. The poached kohlrabi part, contains the exact herb mixture as the famous Shirazi rice dish. Aside form the metaphor and symbolism, the dish has a robust flavor profile and is, indeed, delicious. In a hot pan brown the shanks, also adding the fresh herbs and garlic to infuse the oil. Note that black garlic is used in the above picture; there is no mandate on using it! Regular garlic will be more than sufficient. Transfer the shanks and herbs to a slow-cooker (or a regular pot). To the same pan add the shallots and lightly caramelize. Add the curry, turmeric, and tomato paste and toast in the oil. Add the wine and stock and warm up for a minute, making sure all the ingredients are well-mixed. Pour the sauce over the shanks and cook for 8 hours on low. 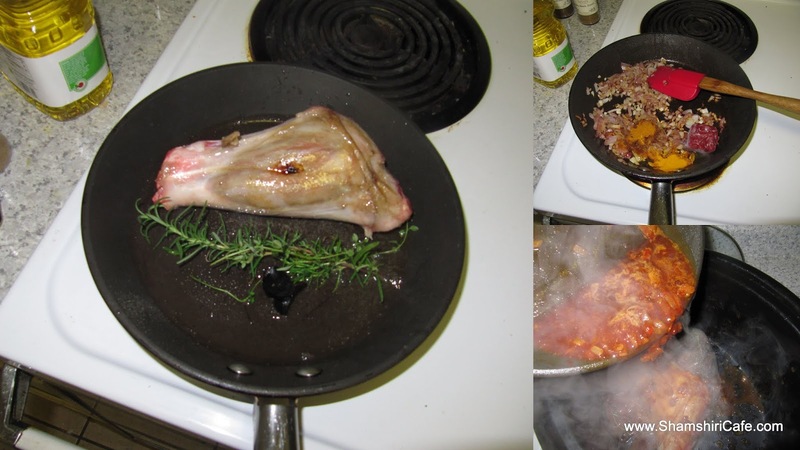 You may alternatively braise the shanks in a covered pot, on very low heat, on stove-top. There, however, is a certain magic involved with very slow cooked shanks, a final quality which other methods do not quite exhibit. To a small saucepan add the kohlrabi and water and season with salt. Poach on medium low heat and uncovered. When cooked, ideally, the remaining liquid should be reduced to ¼ cup. 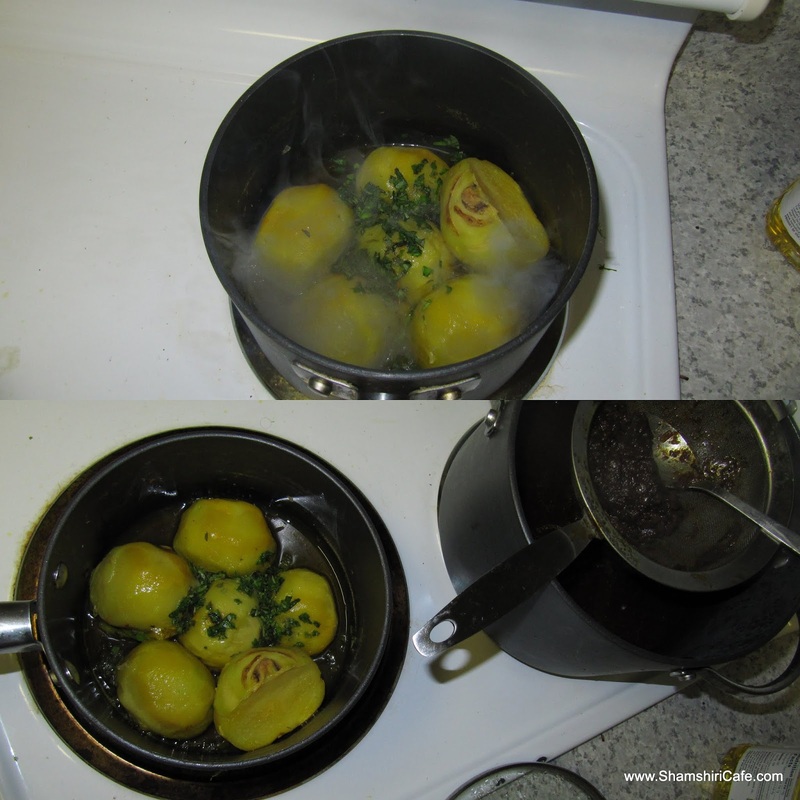 In case the kohlrabi is not cooked but the liquid is thick, add more water; on the contrary, if the kohlrabi is cooked but the liquid is not thick, increase the heat to high until the sauce is thick. Add the maple, lime juice, and saffron. Remove the pan form the heat and spoon out the kohlrabi pieces. Whisk the cold butter into the sauce. Return the kohlrabi pieces to the pan and mix in the fresh chopped herbs. Strain the juices from the slow-cooker and reduce to a thick consistency. Lay the shanks in a serving platter and pour the pan juice sauce over. Arrange the kohlrabi pieces in between the lamb pieces and pour the butter herb sauce over them.